Born in Bavaria, Levi Strauss immigrated to San Francisco during the California Gold Rush and opened a wholesale dry goods business, Levi Strauss & Co. In 1873, Levi and the Reno, Nevada tailor Jacob Davis created the first blue jeans when they received a U.S. patent to make men's denim work pants with copper rivets. With this patent, they began to manufacture blue jeans, known today as the Levi's® brand. 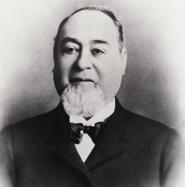 Levi Strauss & Co. is still privately held by descendants of the Strauss family and is one of the world's largest brand-name apparel marketers, with sales in more than 110 countries.